The illustrated Old Timer Knife is the Pioneer Old Timer Knife that features a clip blade made of 400 series stainless steel with a nail nick for easy opening. The sawcut brown Delrin handle of this Old Timer knife, 4.0" closed, has brass liners, Old Timer shield inlay, nickel silver bolsters and a lanyard hole. The Old Timer Pioneer Knife weighs 2.5 ounces. 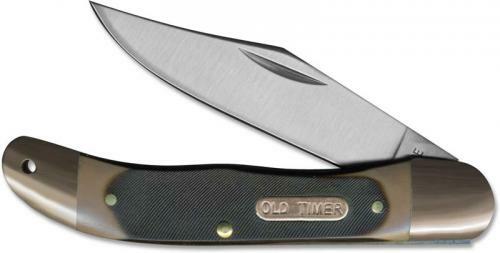 This Old Timer Knife is imported from China.